I have something that every fly fisher wants. It was a gift. You can not get one at your local fly shop. Even the fanciest sporting goods stores do not carry them. L.L. Bean and Orvis advertise them but do not sell them. I have my own trout stream. My wife and I are the caretakers of her family farm in Southeast Vermont. It is termed a “Century Farm,” which means it has been in her family for about one hundred years. Quite remarkable in this day and age. The small farmhouse, which lies on fourteen acres, is comfortable and sports a 60’s kitchen resplendent with avocado green appliances. On the property there are actually two streams, a little one and a big one. The little one comes off the mountain into the big one. The big one flows into the local river that has a town named after it. Like most streams, it has its seasons, and even personalities. Sitting on the porch I can observe them all. The stream is a little overgrown now. My father-in-law Howard, when he was with us, kept the fields manicured to perfection. He had an old Oliver tractor and a side bar mower that he pulled behind it. Howard could mow circles around most farmers with that rig. He also kept a section of the stream clear for fishing. He even had Vermont Fish and Game stock the stream for everyone to fish, but that has been over thirty years ago. Howard did not believe in posting his property. Like Hawkeye in the Last of the Mohicans, he believed that no man owns the property, but we are all just caretakers of it. I have tried to maintain that philosophy during my tenure. The stream is a typical New England trout stream. It is not very wide. 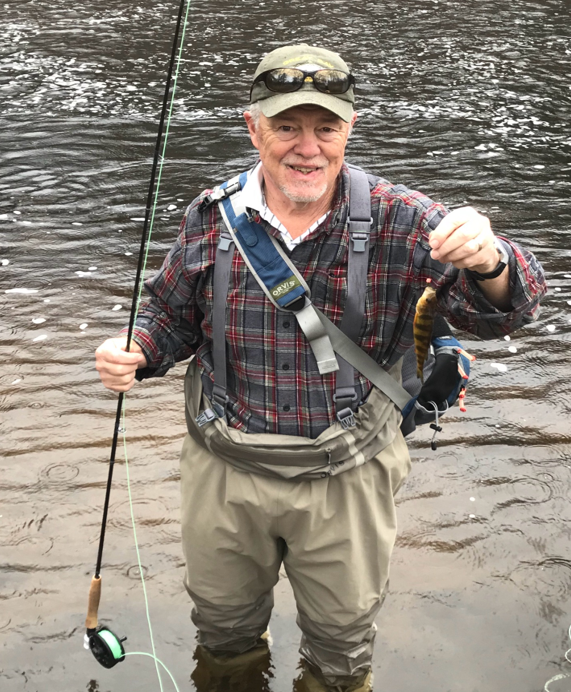 It is very fishable with a one to three weight fly rod since most of the Brookies are wild and only about six to seven inches long. I usually only fish it in the spring and the fall. In the summer, with the water level usually low and the heat high, I don’t want to stress them out. The stream is home to a number of critters. As I mentioned, we have had families of beavers come and go over the years. The dams they build are amazing and help make good swimming holes for the kids. On my last trip over we saw a pair of eagles fly up and down our little valley. I have seen a deer with her doe and my buddy the groundhog keeps checking to see if I have planted anything that resembles his dinner. When I received this gift many years ago I did not fly fish. Now that I do, I look at the stream through different eyes, and with different responsibilities. I am hoping I can pass the stream on to my family so I know that at least there will be one spot in New England that will still have some wild trout. Thanks Howard.